Forging(Hada): Forging mark is conspicuous wooden grains mark of Itame-hada and streaming ware of Masame. The weaved scene that comes from refined steel and flexible iron generates darkish line of Nie so called "CHIKEI" clearly against the mottled sparkling Ji-nie glitter so called Shirake-Utsuri reflection. Temper(Hamon): Hamon is a bit on stronger side fine Nie-base, tight crystallized quench line of 3 round head Gunome aligned regularly so called Sanbon- sugi hamon.The interior is filled with mist-like area that contains thick deal of feet Ashi which almost thrusts out from cutting edge. Temper of tip(Boshi): Temper of boshi is undulating Notare then forms the side view of Jizou stone stature turns back in a good manner. Tang(Nakago): Nakago is UBU original, heel of Nakago forms kengyo V-shape on bottom. One Mekugiana peg hole. Crossing "Higaki" filemarks. The signature in front is 2 large character KANEMOTO 兼元. The famed maker 2 nd generation of KANEMOTO 兼元, one of the most distinguished makers who ranks with KANESADA 兼定 as a star sword smith who was an extraordinarily skillful maker with top ranking of the most supreme sharp cutting performance among all " Saijo O-waza-mono" and has been highly praised, named for"Makoroku" 孫六　by his nickname. The KANEMOTO 兼元 and other two makers of MASAMUNE 正宗 and MURAMASA 村正 all have been familiar with many anecdotes about Japanese swords history. The famed smith "Makoroku" KANEMOTO 兼元 was agressively active during circa Daiei-Kyoroku era (1521-31) and supposed his activity 30 - 40 years till end of Tenbun era (-1554). The inscription of "Makoroku" KANEMOTO 兼元 forms large, broad-minded with dignified manner. The famed commander of Samurais in the Warning States period such as Toyotomi Hideyoshi 豊臣秀吉, Fukushima Masanori 福島正則, Yamanouchi Kazutoyo　山之内一豊, Aoki Kazushige 青木一重 or Maeda Toshiie 前田利家 were eager to own "Makotoku" KANEMOTO to survive the never-ending strives. Gold folied copper ground Habaki collar. 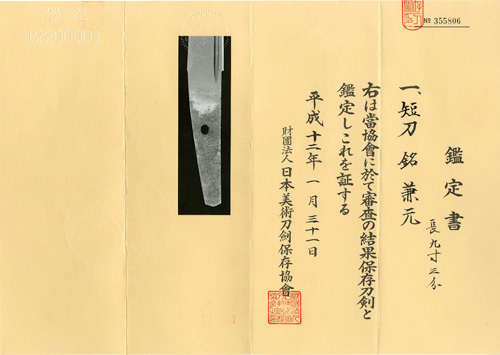 Preserved in a plain wood mounting of Shirasaya.